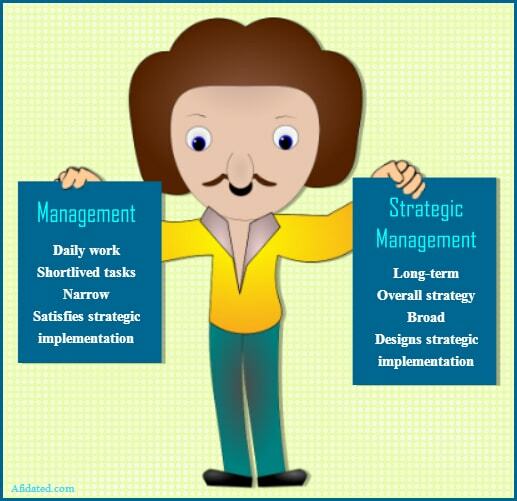 It is often thought that management is just another synonym for strategic management. Truth is that it is a misconception. The two are different things in a business. Strategic management is all about designing the overall strategy for the company. Three elements are attached to it. The first one is strategic analysis which can be defined as doing a systematic analysis of where the company stands. Second one is making strategic choice and this has to do with formulating a course of action. The last one is strategic implementation and this can be defined as technical details on how to put the designed strategy into work. Management, on the other hand, is the day to day job of the manager. It consists of five functions as stated here. This means that typically, an operation manager is deals with the quality of the production. Within it, we have buying of raw materials, various kinds of job approvals, machinery, inventory management and much more. However, the manager of the marketing department is focused on the promotion of the product. Thus, management consists of jobs cut into smaller portions. They fall under tactical planning, a process connected to strategic implementation. but the technical elements can't be ignored. The overall work of strategic management is the responsibility of the top executives of the company. Meanwhile, tactical planning is the responsibility of the managers at mid level and that is also in several forms. As we saw earlier, a company can have both operational and marketing managers. This should hint that the management takes a narrow path. Its counterpart, on the contrary, is all-encompassing. In other words, it takes into account all parts of the business. Additionally, management decisions are usually short lived and based on general guidelines. But strategic management is continues and its decisions are designed to live for three to five years. Of course, change is permissible simply because of the volatility of the environment.